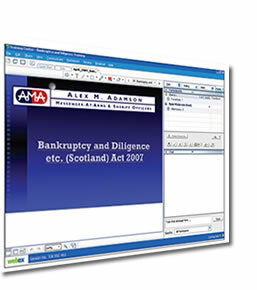 Alex M Adamson has now invested in new technology that allows us to deliver training directly to your desktop .As long as you have an Internet and telephone connection we can deliver presentations direct to your PC. There is no limit to the number of people that can listen in to these presentations. An added advantage is that the sessions can be recorded and viewed again at a later date.